Homes with animals have an additional challenge. Whilst they are often our best friends the truth of the matter is that they are our carpets worst enemy. It’s impossible to choose one over the other, unless you select hard flooring alternative for throughout your home. With this in mind, it is important to equip yourself with the relevant detail so that you can do all you can to keep your carpets clean. This is a much better alternative than banning your animals from rooms where you have carpet fitted. What are your pets doing to your carpets? Saliva: bacteria is carried in dog’s saliva. This isn’t necessarily through drooling but from a dog resting on upholstery and carpets. Dirt: whilst animals are outside dirt and contaminants get trapped on their fur. This is then transferred into our homes when the return inside. Dandruff: this is part of the reason as to why humans are allergic to pet and pet hair. It is thought that almost 10% of the population has such allergies. What can all of these elements mean to us? Therefore, it is imperative that such contaminants are regularly removed. This can be done with hovering but it is also important to keep on top of deep cleaning with the support of our help. We offer professional carpet cleaning services for Buckinghamshire and all the surrounding areas. 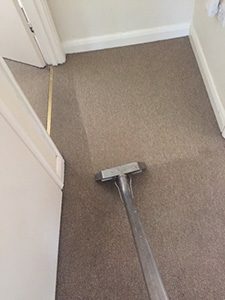 This is a carpet that we recently cleaned in Watford. Looking for carpet cleaners in Watford? Look no further. Once again ingrained dirt and bacteria was lifted from this carpet. Once the carpet cleaning process has been completed, they are left hygienically clean and looking great. With our support, you are able to achieve clean carpets without exception. Call us today on 0800 695 1118.